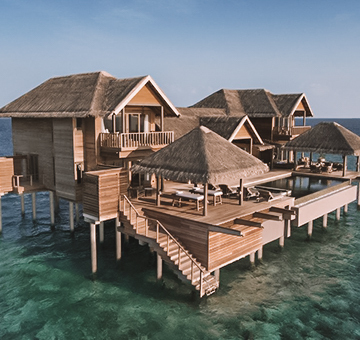 Create cherishing memories in Vakkaru Maldives encircled by the endless Indian Ocean bordered by the soft sandy shores and blissful surroundings. This reef island is settled within the UNESCO biosphere of Baa Atoll is truly a paradise within the Maldives and at Vakkaru, you will be in for a paradisiacal vacation unlike any other. It offers superlative accommodation options backed by modern luxuries, plenty of activities to engage in, four restaurants and two bars to indulge in your favourite cuisines around the world. 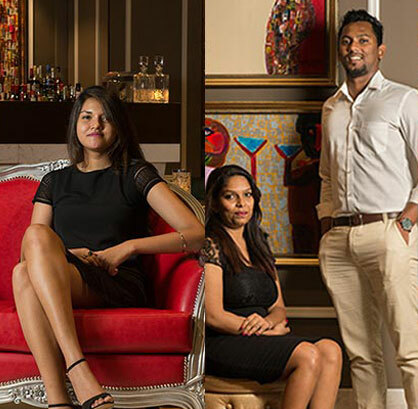 Whether it’s an intimate getaway, or holidaying with family or friends, Vakkaru is the place to be in one of the most desired islands in the archipelago. Beach Villa Beach villas are settled on the northern side of the island, with elegantly designed spaces and modern amenities. These rooms are perfect for a couple or even for a family with one child. It also offers king-sized beds, indoor and outdoor shower, private beachfront terrace and direct access to the beach. Beach Bungalow Perfect stay for those who love the ocean as the Beach Bungalows are a few steps away from the soft white sandy shores and the turquoise waters of the lagoon. You get an indoor and outdoor shower, private beachfront terrace and direct access to the beach. Lagoon Villa An ideal accommodation option for couple looking for privacy during their vacation or families to rekindle connections with one another the Lagoon villa is secluded with luxury amenities at your fingertips. You can read a book in your own relaxation/reading area, sleeping area for two children and a daybed in the parent’s room for a larger family. 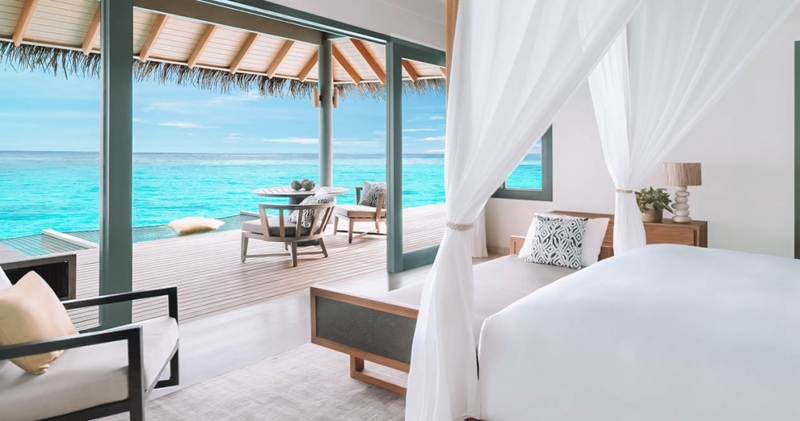 Over Water Villa You’re in for a romantic getaway in an oh-so perfect set-up in the Overwater villa where the turquoise blue lagoon lies beneath as you fall asleep in your perfectly well-thought-out room. You will have direct access to the lagoon with a private over water sundeck to soak up the sun. Beach Pool Suite It’s your home away from home in Vakkaru as you get your own living room in the Beach Pool Suite backed with luxury amenities. These suites offer a private pool, ocean views from each room with king-sized bed, views of the lagoon right outside the bathroom and direct access to the beach. 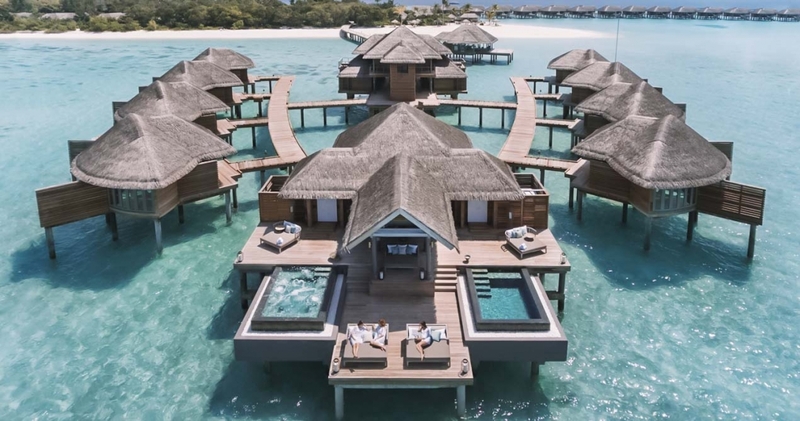 Over Water Pool Suite These villas feature the same luxury features as the Overwater villas but offering extra features such your own living room, bedroom and a bathroom overlooking the azure blue waters of the lagoon. You can enjoy an evening at the private overwater terrace or just enjoy some time with your family in your private pool with panoramic views of the lagoon. Deluxe Beach Pool Suite These spacious suites offer a private garden with ample privacy for thse who would love to enjoy a holiday in peace. You will get a private pool situated in the rear garden, ocean views from each room, an indoor and outdoor shower and beachfront terrace to indulge in sunset views. Family Beach Pool Villa Apart from the exclusive features of all the guest villas, Beach Family Pool Villas offer a separate sleeping area for two children and a day bed in the main bedroom. You will get your own pool and private beachfront terrace to enjoy some fun in the sun with your family. Two Bedroom Beach Villa Create memories with your family or friends as the Two Bedroom Beach Villas offer ample space to fit in a larger crowd. 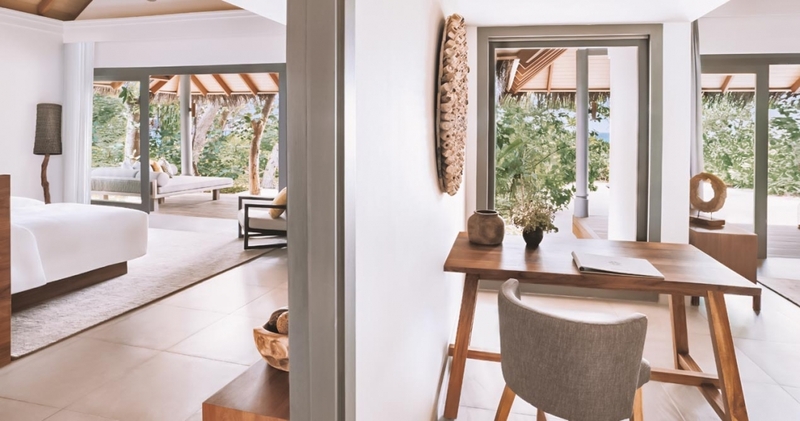 These villas offer one king and one twin bedroom with an interior interconnection door, two day beds and space for an extra bed and private beachfront terrace. With endless views of the ocean with an ambience radiating a comforting feeling in the air, the Lagoon Bar is ideal to wind down on a late evening to enjoy the sunsets whilst sipping on your favourite classics. Or walk in to the bar to enjoy evening snacks with your friends at the sushi bar and the tapas menu or to converse over some tropical cocktails. Sip on refreshing beverages and spirits by the pool at the Cabana with a beach club atmosphere. This poolside lounge is perfect to end a day’s adventure, to relax and unwind or to indulge in pre-drinks before you head out for dinner. Your Italian feast is right inside the island as Isoletta offers Italian favourites amidst a relaxed environment by the pool. You can either have lunch or dinner on a communal dining table or dine in Italian style in the lounging space and 2 seaters a la Milano. For those who crave Asian food, Onu is the place to be. They serve South East Asian dishes including Vietnamese cuisine and regional food from the past and the present. 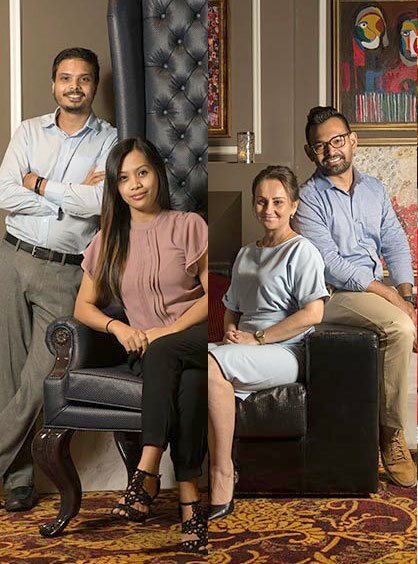 The ambience is invigorating as the interior is decorated with bamboo showcasing the kitchen, counter dining, garden pavilions and the lounge area. With a flicker of island flare, Vakku is a refreshing spot to dine in with an open-air space offering sumptuous grilled dishes whilst the guests are able to enjoy the preparation of their food. You can pair your food with the finest of wines amidst luxurious atmospheres and is perfect for a date night while you’re holidaying in the island. With an airy atmosphere and comforting surroundings, you will be in for a delightful dining experience at Amaany. From international cuisines to locally inspired dishes, your dining options are endless and to top it off, with their interactive presentations and live cooking stations, it is assured to be an exciting one as well.